An opening act expects (or at least hopes) for a crowd that grows in size and energy during their set. 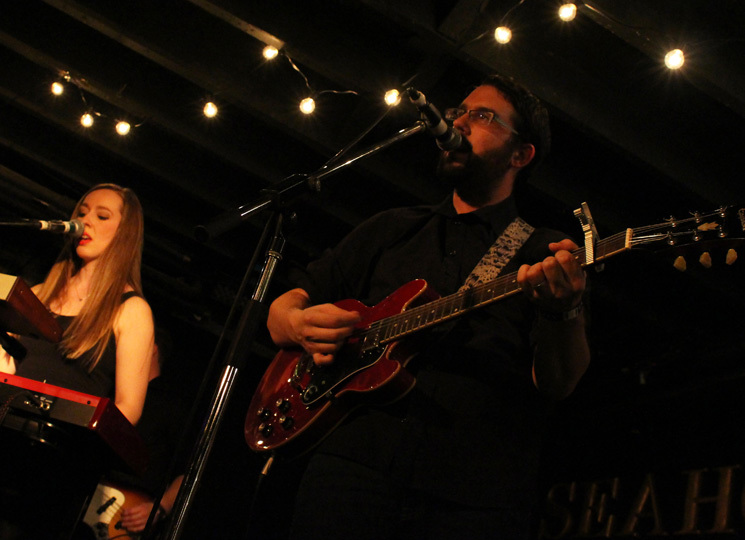 It's a bit more peculiar to see a rising tide of humans flooding into the venue throughout a headliner's performance, as was the case at last night's Quiet Parade album release show at Halifax's Seahorse Tavern. "Sad bands get all the love," quipped frontman Trevor Murphy after one particularly strong crowd response. Admittedly, some of that love was being held back a bit, as many of the new arrivals pushing the venue to capacity were there primarily for the after-show festivities. In a shrewd bit of programming, Murphy, his bandmates in Quiet Parade and several special guests (including opening act Kim Harris) were reviving their Taylor Swift tribute set, one that sold out two shows in one night this past February. Is it a calculating move to pair your band's own concert with a cover show, one where if attendees don't arrive early they're unlikely to get in at all? Absolutely. But it's also an earnest one: later that night, Quiet Parade's members performed Swift's hits — from early tracks like "Teardrops on My Guitar" to blockbusters from 1989 — with the same affection and enthusiasm as they had for their own songs earlier. That there's a bit of a gap between those two sets probably goes without saying (especially since Quiet Parade are frequently voted Halifax's "Best Band to Enjoy Quietly" in the city's alt-weekly The Coast). But the gap is not as large as you might think, and the fuller, lusher sound on Quiet Parade's new self-titled album closes it somewhat. You'd never mistake show-opener "All My Time" or the band's current single "We Were Here" for world-conquering pop radio anthems, but they hit on their own terms: glistening chords, sweetened melodies and a rooted sense of the familiar that rings out from every acoustic guitar strum. Folk music is all about lineage, and it's easy to pick out antecedents in Quiet Parade's take on the form. Murphy's vocals have a soft timbre that recall the Weakerthans' John K. Samson or Woodpigeon's Mark Andrew Hamilton. The songs' piano patterns — performed by Julia Weir, whose harmonies are crucial to the band's live sound — echo mid-career Death Cab for Cutie and their ilk. If familiarity occasionally threatened the distinctiveness of some of the show's mid-set songs, the trade-off was that much of the material had a warm, inviting comfort to it. It's a quality Quiet Parade's set shared with that of its opener. In Kim Harris, you have a performer whose signature song ("The Weight of It All") is about the death of her mother, yet it's so powerfully cathartic and soul-soothing that even her band can't help but smile as they perform it. With one album under her belt (2014's Only the Mighty), Harris already has a handful of reliable showstoppers, like "Dust" and the aforementioned "Weight" to build a set around, and she and her band used that space to perform a few very promising new songs. "Uproar" and "Heirloom," in particular, both felt deeply confident, even in their first public airing. Later in the night, during the tribute set, Harris performed two of Taylor Swift's most recent tracks: "I Know Places" and megahit "Shake it Off." But in terms of sheer currency, the night's most relevant performance might have come via a nearly three-year-old song that closed Quiet Parade's set. After all, 2015 has quickly become the year of the phone-angst anthem ("Hello," "Hotline Bling") which makes "How Come You Never Call (or Write?)" — a lonely, slow-burning ode to communications anachronisms — surprisingly topical. The song offers few answers as to why we're so hung up on missed connections all of a sudden, but if you're waiting for someone to ring, it's about as good a soundtrack as you could ask for.